15 years experience in business consulting, public finance, and law. Author of several books on leadership (five stars Amazon). Master of Public Administration, concentration in Leadership (Harvard Kennedy School of Government). Juris Doctor (Humboldt University, Berlin, Germany), Lawyer (Bar Association, Germany). Fluency in German, English, French; conversational Polish and Spanish. As CEO of the Doerffer Leadership Group, Doerffer works with clients across Europe and the US using a unique strategic advisory and consultation process. To date, her clients have been German and international professional services firms, publishing houses, a multi-national consumer healthcare company, client from the travel industry and technology start-up companies. Previously, Doerffer worked as a Project Leader for The Boston Consulting Group → in New York, recognized as a global expert for leadership and talent. Earlier, she spearheaded the Bertelsmann Foundation leadership series → in Germany and Europe with clients from private, public, and not-for-profit sectors. Doerffer started her career at the European Commission, where she managed EU partnership programs in Poland, and led the negotiation of the Financial Aid Program → of $408 million to Romania on behalf of the European Commission . Doerffer holds a Master of Public Administration from Harvard → with a focus on leadership, a J.D. from Humboldt University, Berlin and is a registered lawyer at the German Bar Association. 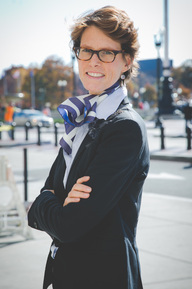 She received additional training in “Immunity to Change” → and “Subject-Object-Interview" → in Cambridge, MA and has been on the teaching faculty for leadership at the Harvard Kennedy School of Government → and facilitated several study groups on leadership at the Center for Public Leadership at Harvard. Publications: Doerffer speaks regularly on leadership at international conferences and is the author of multiple books, studies, and articles, including the five star publication Leadership: Approaches, Developments and Trends (2010) (Five Star rating on Amazon) → , and Web 2.0 & Leadership: The Evolving Web and its Impact on Leadership (2011) → See more at publications.